The move comes amid a 20 trillion rouble ($500 billion) ongoing state rearmament program and rising tensions over Ukraine. Russia's Defence Ministry has signed a 30 billion rouble ($630 million) contract with a major state-owned aircraft manufacturer to modernize over 50 of its high-speed MiG-31 interceptor jets, the RIA Novosti news agency reported. "The armed forces will receive over 50 modernized MiG-31s by the end of 2018," RIA quoted Deputy Defense Minister Yury Borisov as saying Thursday. The modernization will be carried out by Russia's largest aircraft manufacturer, United Aircraft Corporation. The MiG-31 is a classic Soviet aircraft. Designed in the 1970s as a follow on to the MiG-25 supersonic interceptor jet, the plane is a supersonic bomber killer. Around 120 of the fighters remain in service today, RIA reported. Modernized MiG-31s are outfitted with new avionics and fire control systems, and can simultaneously fire on six targets within a 280-kilometre radius. 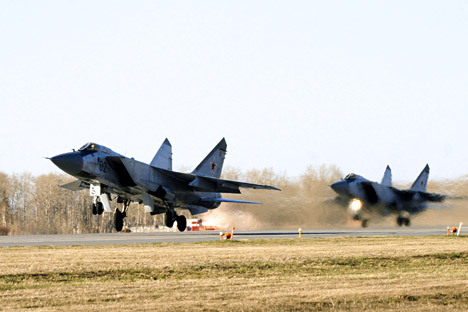 The U.S. and most other Western air forces phased out dedicated bomber interceptors by the time the MiG-31 entered service in 1975, as the focus of Soviet nuclear strategy focused on ballistic missiles. However, the Soviets saw continued need to operate fighters capable of dealing with the comparatively massive U.S. strategic bomber fleet in the event of nuclear conflict. Russia has already modernized around 20 MiG-31s, according to media reports. A separate contract to modernize 60 of the aircraft by 2020 was signed with United Aircraft Corporation in 2011, RIA reported.